Happy Christmas Eve! For those of you working like me, hang in there...only a few hours left! This will be the first year I haven't spent Christmas with my family, it's definitely bittersweet. It will be a new experience for us to spend it with my husband's family, I am looking forward to soaking in the pure joy of being a child on Christmas through our nieces and nephew. On the other hand, I will definitely miss having my siblings and their wives and my mom all together in one room. Thanks to the joys of FaceTime I will be able to send them our love. Winter Holly is from the 2012 Holiday collection from China Glaze, and in my opinion the most unique. So many of the Holiday collections are a grouping of red, green, gold, silver, and sometimes blue, I refrain from purchasing most times. That being said, I kept seeing pictures of Winter Holly in all it's holo-goodness and decided it was for investing in. Plus emerald is the Pantone 2013 color of the year! Justification set! I didn't get as many pictures of this as I usually do, but I think you get the idea! Here is the picture I posted on instagram, intentionally blurry, to show you just how much it sparkles. Your turn now, link up your MerryManicures! Very pretty! Stinks you have to work, but you seem upbeat about it. Hope you have a wonderful Christmas! Thanks for the link-up! I love that color! Its very pretty! Sorry that you are stuck working :( hopefully it flies by fast! LOVE your nails! And I like the mani you posted before this, the neutral nail with the silver accent nail? So gorgeous. 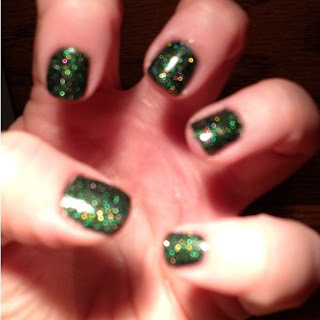 I thought I was over glitter polish until I saw this manicure and the last one! So pretty! I always wear read for Christmas, but I want to get some good greens now!